Close your eyes and imagine you’re standing in the center of your kitchen. Now take away your microwave. You don’t have a food processor or blender. There’s no powerful KitchenAid, George Foreman grill, or fancy automatic bread maker. You have an oven, but there’s no beep when it reaches 350 degrees. You might have an icebox if you could afford to pay the ice man to deliver. So really, you have no fridge and you definitely do not have a freezer. Dianah Darden of Spoonbread and Strawberry Wine, an African American culinary history published in 1977, would have been the age of our great great grandmothers. She lived before the industrialization of our diets with megamarts, frozen food aisles, and microwavable meals. No farm to table movement need exist because there was no alternative to local diets. Fresh foods were always eaten when the weather permitted and then extra was packaged to last the winter. Farmer’s market kirbies – always perfect, despite their blemishes. Pickling is one of the oldest methods of food preservation and is found in every part of the world. Put simply, pickling is the process of adding acid to vegetables in order to prevent the growth of harmful bacteria. This is accomplished either by fermenting with weeks of curing in a salty brine to produce lactic acid or by quick pickling by marinating and storing the vegetables in an acid/vinegar solution. Antimicrobial herbs and spices, such as mustard seed, garlic, cinnamon or cloves, are also added to season and naturally preserve. Vegetables, fruits, jams, jellies, and salsa can be stored for up to one year once the jars have been “processed” by boiling to seal. While most chores for every day life in Dianah Darden’s time are happily tucked away in history, natural food preservation remains relevant in the city and countryside alike. Processing the summer harvest from your garden or farmer’s market can be an easy and fun return to culinary traditions and a real way to eat local foods year-round. Just imagine how awesome it will be to mix up monotonous winter vegetables with your very own pickles! The latched jar went to the fridge. The quart jar was split into pints so I could submerge in the boiling water to seal. Wash jars, lids and bands in hot, soapy water. Keep warm until ready to use to avoid breakage when filling with hot foods. Slice pickles 1/2″ thick for nibbling or 1/8″ thick for sandwiches. Divide evenly in jars with minced garlic, dried dill, and crushed red pepper flakes. In a small pot, combine peppercorns, mustard seeds, salt, sugar, vinegar, and water. Bring to a boil over medium-high heat then lower to simmer for about 3 minutes to dissolve salt and sugar. Remove from heat and cool for about 15 minutes. Pour brine over cucumber, making sure to submerge the vegetable. If you are going to eat them within a month, screw or latch the lid tightly and refrigerate for at least a day before tasting. If you are canning for long term storage, remove any air bubbles by sliding a small non-metallic spatula inside jar and gently pressing food against the opposite side. Screw the bands over the center sealing lid. Submerge jars in a large pot with at least 1″ of water to cover. Boil pints for 5 minutes and quarts for 10 minutes. Remove from water and cool on counter top for at least 12 hours. Press on center lid to make sure it will not flex up or down. Also, I highly recommend reading more on canning to make sure your long-term canning method is safe. Thanks for sharing. The recipe seems delightful and tasty. The packaging is great. Thanks, Aaron! Let me know how it turns out if you give it a try. 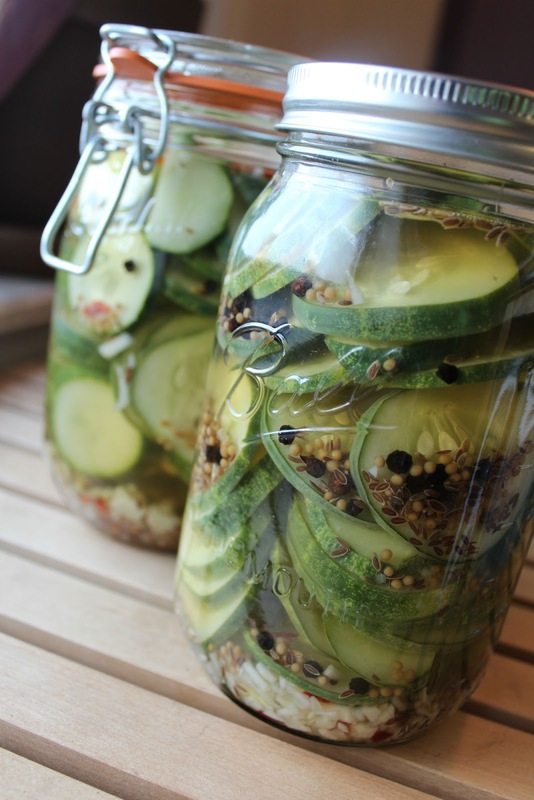 And once you’ve eaten all of the pickles, you can drop more cucumbers in the brine and enjoy them again. I am looking for a pickle recipe. Do they all have this much salt? I am curious, as I have never made them. One tablespoon of salt per quart is about average. Don’t forget this recipe is for a huge batch which, if you’re like me, you will devour far too quickly! I’m pretty sensitive to salt and these pickles were spicy and zesty from the red pepper and garlic but the salt was not a noticeable flavor. I have read, however, that if you are not processing the pickles for long-term storage, you can use low-sodium salt. This is indeed a good repice, and I make my share of dills each year but always canned. 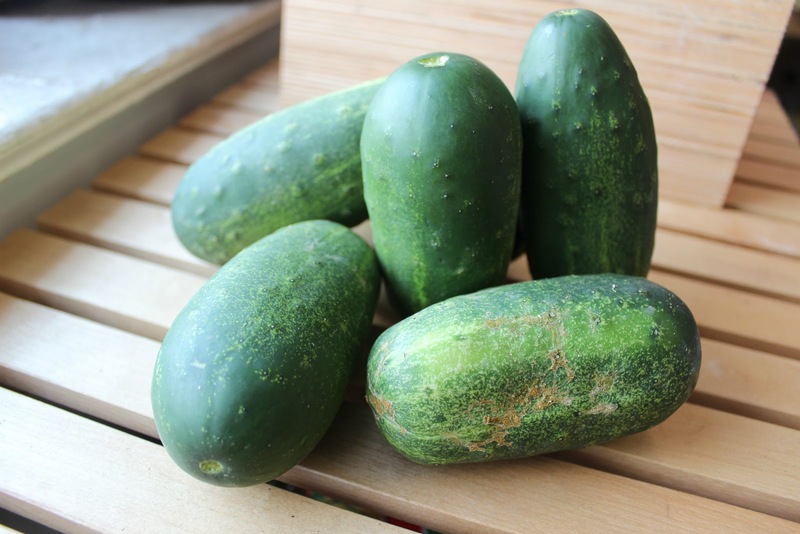 (processed) These are indeed crucnchier, and I made them from the very same batch of cukes as the ones I canned, so no variables in my experiment! Great taste!